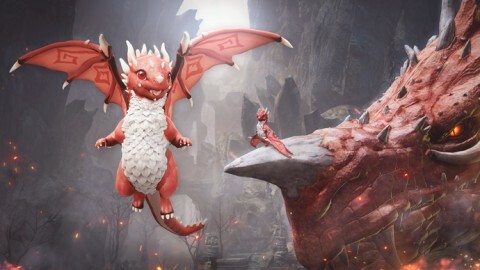 New Event: Stop the Mutant Lakiahro! - For the Grand Finale, Koi will appear more often and in more areas! 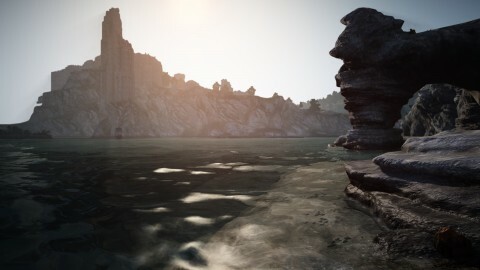 Koi will be obtainable in Valencia Lake, the pond next to Duvencrune Hot Spring, and Grana Stream. Also, the fishing rate for Koi has increased 1.5x. Crowd Control (CC) effects during PvP have been adjusted. - Previously, Stun, Stiffness, and Knockback effects were counted as a set. Bound, Knockdown, and Floating were in another set. Lastly, Grapple was considered an exclusive effect that could be applied in any situation except for Invincibility. 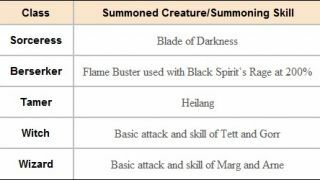 - These categories were introduced to make each skill effect’s characteristics more noticeable, but the difference in each character’s distinct Crowd Control skills led to some unfair advantages. Notably, Grapple worked as an exclusive Crowd Control mechanic which further increased the unfair advantage that classes who owned the skill had over classes who didn’t. 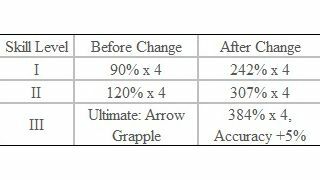 - As a result, changes were applied to Crowd Control effects so that all classes perform attacks and defense in equal terms and conditions. - This is only a part of the entire balance work we are hoping to apply in order to better ensure equality among classes and Damage dealt for certain classes will continue to be adjusted. 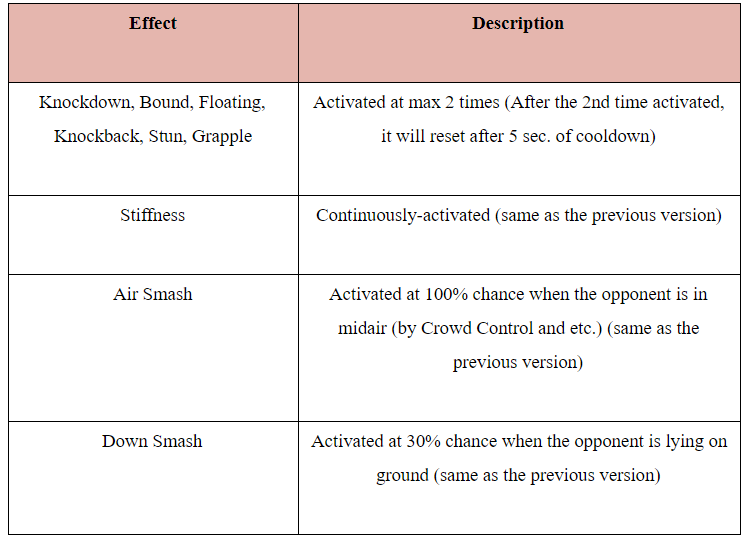 - Crowd Control effects (Knockdown, Bound, Floating, Grapple, Knockback, Stun) effects can be performed at max 2 times. After the 2nd time, there will be a cooldown of 5 seconds where no effect will be applied. - From the first Crowd Control skill performed (1st time), the recipient will be resistant for 1 sec. and after will receive a Crowd Control effect (up to 2 times). - The reason for this short period of resistance of 1 sec. is to prevent the stacking of same skills and also to allow combos to be performed in between. However, this period of resistance may be changed in the future for balance purposes. 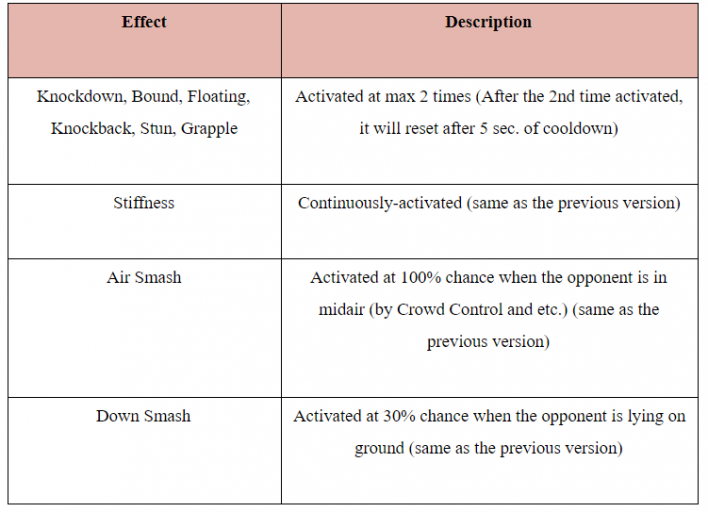 - Air Smash, Down Smash, and Stiffness will not have a count restriction. - When lying down, Stun, Stiffness, and Knockback effects will not be applied and this does not count toward the Crowd Control count. - Even if it’s the same Crowd Control effect, each class will have a slight difference in time of maintaining the effects. 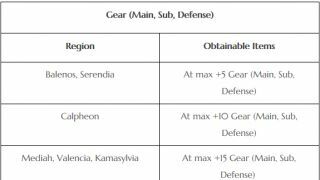 This is due to the different actions performed by each class; this will receive further adjustments in the near future to balance this out. 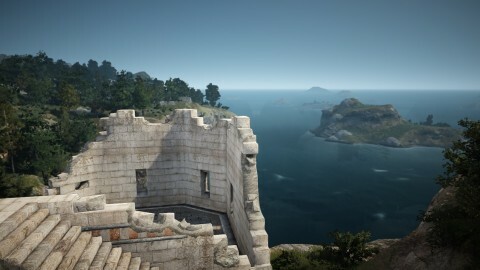 Capes and skirts/dresses will have more realistic physics. Fixed the graphical glitches with the cape of the Goyen Costume when the Warrior is in Awakening weapon non-combat stance. Fixed the graphical glitches with Eternal Snow Dagger that occured when the Ranger is switching to Awakening. Fixed the graphical glitch with the Tamer’s Helmet when fishing while wearing Binari Dress. 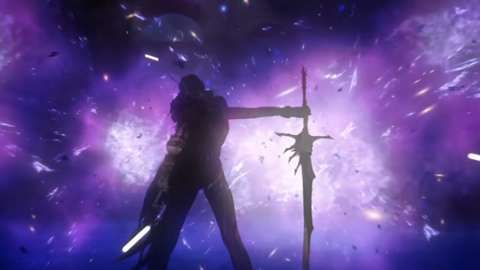 Fixed an issue where the Maehwa could not attack after switching to non-awakening while moving if she has Absolute: Slice. Fixed an issue where the main weapon was not visible after using the following skills with quick slots. Fixed the graphical glitches with Lahr Arcien Helmet with hair types #2, 5, 12, and 15. Fixed the graphical glitch with Owl Horn-Rimmed Glasses. 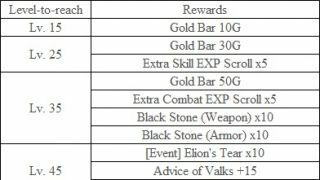 Fixed an issue where item descriptions of the following items did not include any information regarding Enhancement effects (AP/Evasion/DP increase). 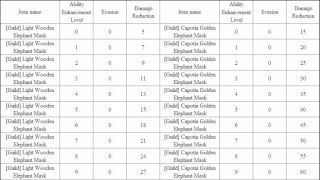 Fixed an issue where the item description of Krea Ornamental Knot did not include any information about Enhancement effects (Evasion increase). Fixed an issue where you could not use items in Clorince’s Bag. New furniture, Doll of Remembrance, has been added. Item descriptions of Caphras Stone and Ancient Spirit Powder have been edited to sound more natural. A new system where you can date an NPC has been added. - If you build up enough Amity with a certain NPC, you can confess your love to him/her. If he/she accepts, you will be his/her boyfriend/girlfriend. You will also acquire a special Title. - You can now send a gift to certain NPCs. 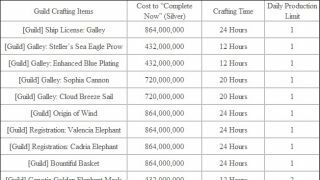 - All items that can be registered at the Marketplace (less than 50 mil silver) can be gifted to NPCs. You will get some Amity points by sending gifts. - Each NPC has items that he/she likes, and you will get more Amity points by gifting them the items they like. - Gifting the items that NPCs like will consume 5 Energy per gift. - If your Amity with certain NPC is above 1000, you can confess your love to him/her. - The NPC will say that he/she needs more time to think about it. - You will receive a letter of acceptance or decline from the NPC after next regular maintenance. - If the NPC accepts, you and the NPC will be a couple. But your Amity with him/her will decrease 10%. 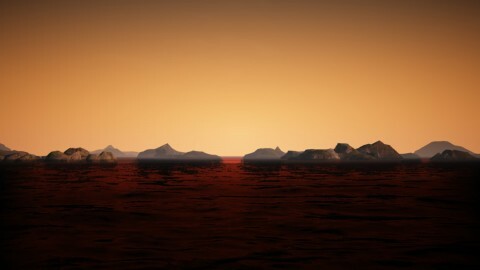 - The special Title is “Boyfriend/Girlfriend of (NPC Name)”, and will be in a different color from the regular Titles. - If the NPC declines your confession, you will not get anything and the Amity will decrease by 5%. - Anyone can confess their love. The boyfriend/girlfriend will be determined by the value “your Amity/Total Amity of everyone who confessed to that NPC”, and RNG as well. - You can date the NPC for a week (the Title will be valid for a week as well). You cannot confess your love to other NPCs if you are dating someone, but other players can confess their love to the NPC you are dating. 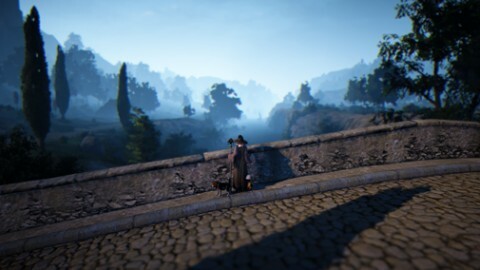 - If you are dating an NPC and your Amity with him/her is the highest among all players, the dating period will be extended for one week. If you don’t have the highest Amity, the NPC will get a new boyfriend/girlfriend (will be determined by the condition mentioned above). - If the NPC you were dating is leaving you for someone else, you will receive a farewell letter from him/her. - If you confess your love to 5 NPCs simultaneously, you will get the title “Player”. - If you confess your love to 10 NPCs simultaneously, you will get the title “Casanova”. The Guild Incentive/Payout system has been reworked. - There will be 10 Levels instead of 4. - You can set the Guild Incentive Level for each member or for all members, and the associated UI has become simpler. - The max payout is 40% of the total Guild Fund. - The total payout divided by the sum of the incentive level for all members will be the “coefficient”, and the actual money you receive will be the coefficient times your incentive level. A new system where you can transfer your checked-in mounts to other towns has been added. - Talk to the stable manager or wharf manager to use this feature. 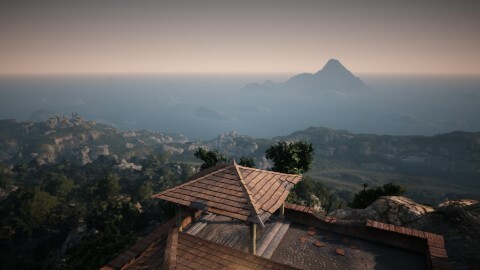 You cannot send your mounts to a town you have not discovered yet. 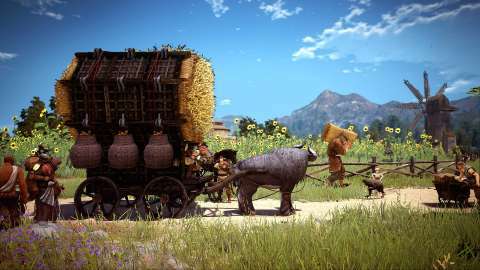 - You cannot send your mounts to another town if the mount has items in its inventory. - The cost will be 100,000 silver, and it will take 10 minutes. - Ships cannot be transferred to places where they cannot be checked in. Fixed an issue where you were trapped inside the Epheria Frigate if you change channels while on the Epheria Frigate. Fixed the graphical glitch that occurred when the character is around the cargo area of the Epheria Frigate. Forest Path Wagon has been buffed. 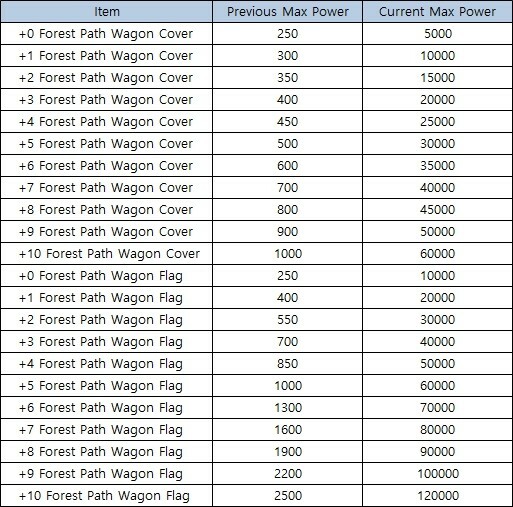 Max Power of Forest Path Wagon Cover and Forest Path Wagon Flag has increased. Fixed an issue where the max HP debuff due to consecutive victory in the Team Battle was not refreshed. Fixed an issue where characters could not move after leaving the Team Battle while spectating. Fixed an issue where you could not see other characters in the Team Battle. In the Team Battle mode in Arena of Arsha, players will not get max HP decrease due to time progression. However, players who are on a winning streak will get the max HP debuff. In the Item Transfer window, the location where the items first departed from will be displayed. Fixed an issue where Arduanatt’s wings were not visible after using Instant acc. or jumping immediately after drifting. Fixed an issue where placing Elephant Fountain in a two storage house made the first floor flood with water. World Boss Mirumok Destroyer Offin will be easier to kill. - Offin Tett’s attack speed has decreased by 20%. - The AoE of Offin Tett’s charge attack will be visible. - Offin and Offin Tett will not be stronger when Offin’s seal is broken. If they have already powered up, they will return to their original states. The graphics when World Boss Mirumok Destroyer Offin and Watcher Offin Tett power up have changed. 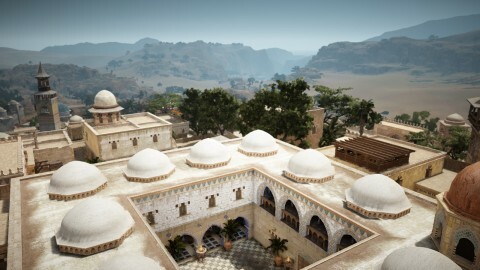 Aakman Temple and Mirumok Ruins have been reworked. 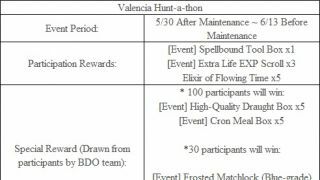 - Grinding difficulty has been adjusted, and rewards have been buffed. Mirumok Ruins is designed for party grinding, so will be more rewarding when grinding with others. - Amount of trash loot has increased. 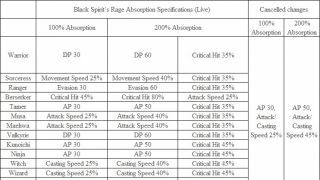 - Drop rate of Caphras Stone and Ancient Spirit Powder in Aakman Temple has increased by x1.2. 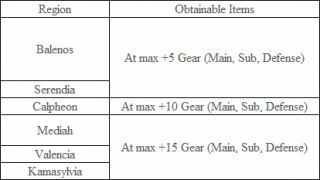 - Drop rate of Valtarra Eclipsed Belt in Mirumok Ruins has increased by x2. - Mirumok, Old Mirumok, Degraded Old Tree Treant, and Voraro will drop Crogdalo’s Origin Stone. - DP of the monsters in Aakman Temple has decreased by 7%. Wandering Rogue Giant Soldier will have a more natural animation. Fixed an issue where some monsters were not aggravated properly. 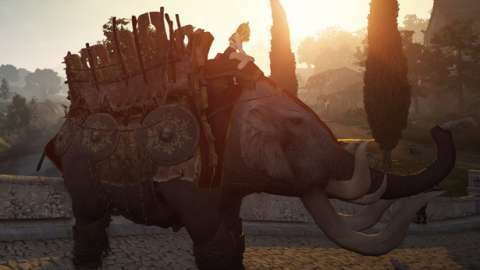 A new chain quest available in Drieghan has been added. 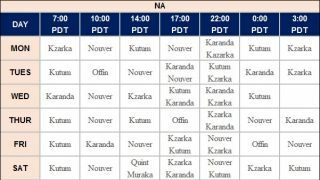 - The characters that have completed the “Azunak’s Story” chain quest can accept the new chain quest from NPC in Duvencrune. 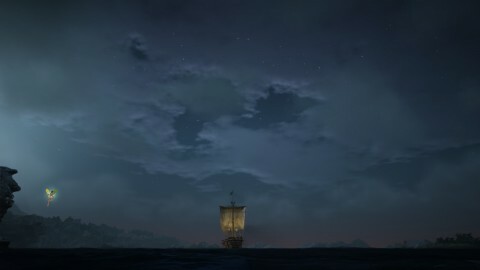 - This chain quest can only be completed during the night time in-game. 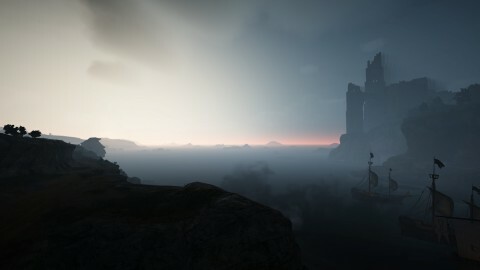 New daily quests only available once a day for each family have been added in Drieghan. 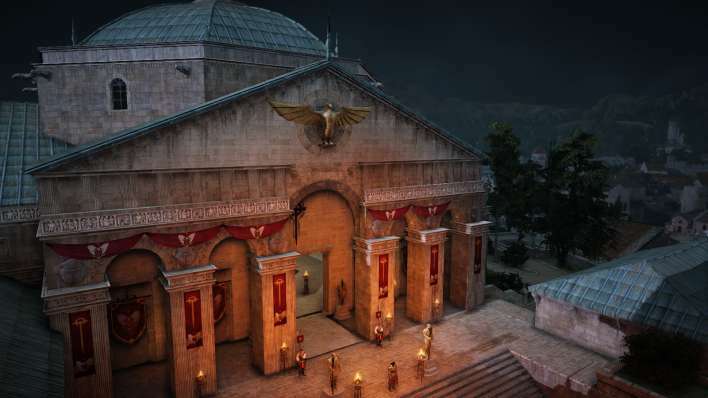 - Some of these quests can only be available once you have finished its previous quest or have certain Knowledge. Ancient Spirit Powder will be given out as an additional reward for the repeatable combat quests in Valencia, Kamasylvia, and Drieghan. It has been fixed so that the Knowledge for Caphras Stone can be obtained as a reward for the ‘New Substance’ quest. - If you have already completed the quest but haven’t obtained the Knowledge yet, you can get it by talking to Eileen. The awkward parts in the NPC dialogue for some quests have been fixed. The awkward parts in the title and descriptions of the ‘Destroy the Protection Towers’ quest have been changed. The awkward part in the description for the following quest has been changed. The awkward parts in the objective description for some quests have been changed. Some of the quest icons have been changed to go with the quests. The awkward parts in the description of some Knowledge have been changed. 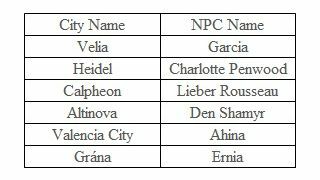 Fixed the issue where the names of certain NPCs were shown incorrectly in some areas. Fixed the awkward parts in the dialogue of certain NPCs. Fixed the issue where the last part of the dialogue was shown blank when pressing the ‘About the Shining Wild Herb’ button after talking with the farm NPC in Duvencrune. Fixed the navigation for the NPC Manager in Cadry Ruins. Altered the game so that NPCs will appear on the screen much quicker when entering areas with many NPCs. 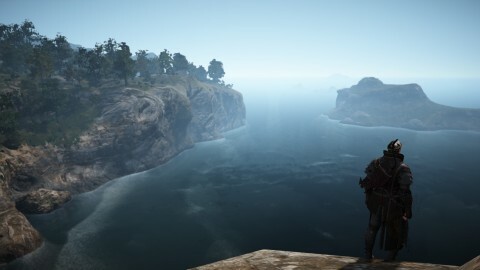 Fixed the issue where a character would pass through some of the rocky geography in Gavinya Volcano Zone. Fixed the issue where the quest list was shown improperly when clicking on the quest tab while using the Guide with Black Spirit summoned. Removed the shortcut mark in the warning message that appears when enhancing equipment with Caphras Energy applied to them. Crafting Note Icons for the following items have been added. The icons for the Renown Score Tag have been added. - You can see the icons in the Equipment and My Profile windows. Now the blue mark emphasizing the Renown Score is shown properly in the Renown Score window. Fixed the issue where the guild name was shown above the character’s name instead of the union name when the player registered to a union accessed a server in the middle of a Node War. Fixed the issue where the heal button would appear while the Guild Mount is summoned. - You can only heal it when the Guild Mount is not summoned. Changed the message that appears when trying to gather with insufficient energy. Fixed the issue where a message appears saying it’s possible to revive upon dying in the Savage Rift. The message that said Abnormal Animation Combos in certain situations has been changed so that it says try again later, and it has been fixed so that the message shows only once in such situations for gameplay optimization. Fixed the issue where the message does not appear properly when a union member dies during a Node War. They changed the core mechanics of how some classes work, ninjas, zerkers, strikers etc relied on grab chains to be able to kill opponents, those classes were designed with the old mechanic system in mind, but now they are completely broken and classes that didn't have grabs and had buffs in other areas to make up for it and now extremely OP. witch and wiz for example. here is some clips of how broken the pvp is now... sure the mmo community whine a lot but in this circumstance the dev's have really messed the game up a whole lot. What are KR players reactions to the CC changes? personally I think they are terrible and have ruined most classes in the game, or at the very least changed the playstyle of most classes that people used to enjoy and love. @Coracbra It changes the already trash pvp, which is a good thing. The people that are moaning about it don't understand the changes. AVE Pay To Win PE! Are you blind? 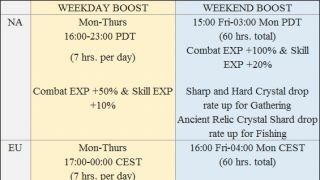 Just switch of all bonuses in PVP! All of them! They made many skills useless, skills that they spen time designing animations for, damage, hits and so on. @Konokolicious hahahaahahahaha LMAO, nice one!